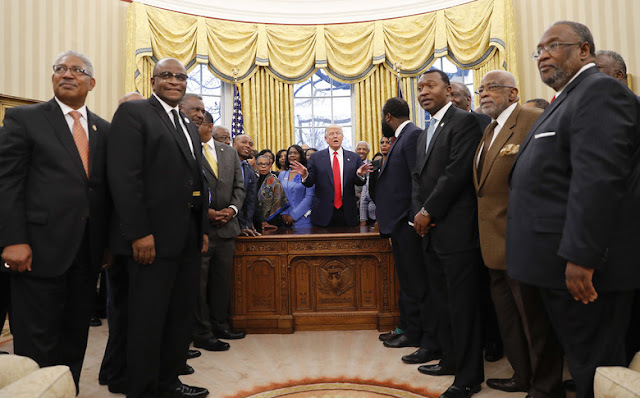 Looks like Trump played some HBCU presidents who are desperate for school funding not just for a photo-op, but for suckers and fools. Trump was speaking out of both sides of his mouth when he promised more funding for HBCUs (which he did not put in the budget) as he is now questioning the constitutionality of a key funding source for the schools. George L. Cook III African American Reports. In February, President Donald Trump invited leaders from historically black colleges and universities to the White House, a move they hoped signaled his support for the institutions and showed an effort to give them more clout in his administration. But critics had a more cynical description of the Oval Office meeting: a photo op. Those naysayers got more ammunition on Friday after the White House released a signing statement connected to the recently approved federal funding measure. Tucked away in the last paragraph, the White House announced that it would treat a program that helps HBCUs get low-cost construction loans "in a manner consistent with the (Constitutional) requirement to afford equal protection of the laws." People in higher education circles worried that the statement meant that the president was planning to get rid of a capital financing program that helps historically black colleges repair, renovate and build new facilities. Congress approved the program in 1992 after finding that "HBCUs often face significant challenges in accessing traditional funding resources at reasonable rates," according to the Education Department. "I would rather have Trump do nothing with HBCUs - not even know they exist," Marybeth Gasman, a University of Pennsylvania professor who has researched HBCU history, told The Washington Post. "He will see them as a handout. He doesn't understand that he was given a leg up by his rich father. He doesn't see that other people need help from programs because of past discrimination and inequity." Read more: Trump questions whether key funding source for historically black colleges is constitional.